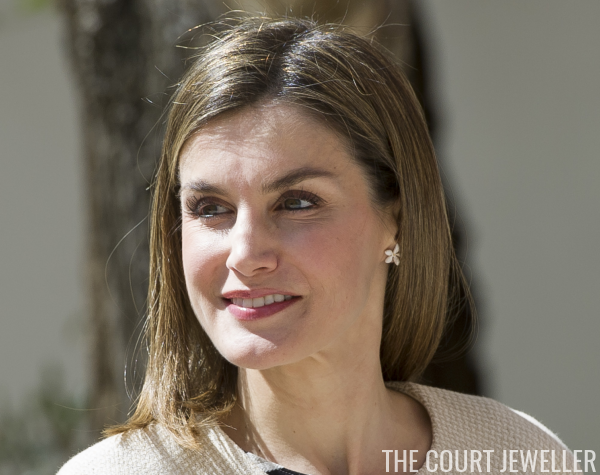 Last weekend, Queen Letizia of Spain spoiled us with two show-stopping pairs of earrings: her gold dangle earrings by Tous and her Bulgari aquamarine and diamond earrings. This week, she went with more subdued pairs from two more designers. On Tuesday, Letizia attended the announcement of the Princess of Girona Foundation Award in Madrid. For the occasion, she wore her Carolina Herrera floral stud earrings. Two days later, Letizia visited the CERMI Headquarters in Madrid. She wore her Hope Egg Earrings by Links of London, a pair of earrings also owned by the Duchess of Cambridge.